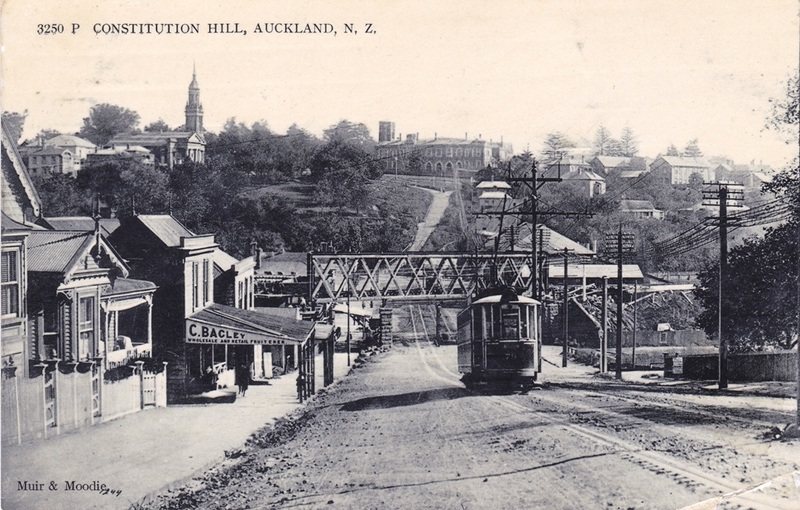 This postcard was described in TradeMe as showing "Constitution Hill" -- which it does, in the centre background, but the main focus I would have thought would have been the road along which the tram was slowly trundling, called at this point Alpha Road, leading towards Parnell. I am writing you a P.C. as I have not got very much news. How is Mc Kinlay, be out with him yet. Who do you think followed Else & I into town. Mr Alf Elliot. Else & I were talking to Nellie Joynt in Newton when he passed. Else didn't notice him so the child passed us again, we spoke to him and never thought any more about him. When we got to town we happened to look back & we spotted him just at the back of us. So we dodged into the Station & we didn't see any more of him. Edie Cross' two cousins from Waikumete are working at Mackay Logans. We were talking to Glady & Bob in town. I think Glady has got the same expression in her eyes as Ern has. I couldn't help noticing it last night. Else's boy & I hate one another like poison, put me in mind of her and his bossy ways, we are just civil to onother [sic] & that's all. Maggie leaving Mennies & is starting at a place in Dominion Road. A much better place. Liz, were she a young lady in today's day and age, might well have fitted perfectly into our Facebook and Twitter-dominated social landscape. Liz's reference to Dominion Road puts this image at some time after 1907, but it's likely from before the 1920s. I referred to Constitution Hill in an earlier post. It's a part of Auckland I'd be nervy of going down, and would need oxygen to climb up these days. I always associate it personally with bus strikes -- when the bus drivers walked off the job, the only way into town in the 1980s was by train, and that meant a climb from Beach Road up Constitution Hill to Symonds Street for me. Felt as if I'd ripped a lung out. Others, when the name was first applied to this pathway upwards in the early 1860s probably felt the same. It isn't named after a parliamentary constitution -- I think it was named after Constitution Hill in London, itself said to be named after King Charles II's habit of walking along the (flat) road from his palace to Hyde Park for his health. Then again, Parliament Buildings were close to the top of it, until Auckland was no longer the capital. Here, though, Constitution Hill lived up to the "hill" part of its moniker. To the Editor of the Daily Southern Cross, —Allow me to call the attention of the authorities to the present dangerous state of the pathway from the Provincial Council Chambers to Mechanic's Bay. A few loads of gravel, a little fencing, and repair of the gutter are required at once, as otherwise our “Constitution hill” will be impassable during the coming winter. A SUBSCRIBER, May 11th 1863. Up to the period I write of, no attempt has been made to overcome the handicap of the cruel hills that shut Parnell off from the city. The railway line along the foreshore was only in the rough, and in any case when the crawling, poisoned trains entered the tunnel. Parnell, the harbour end, was left "in the air," so to speak. I wonder how many dwellers of the eastern suburb—"Parnell, pride and poverty"—of to-day can even visualise what Constitution Hill meant to the dwellers of the 'seventies and 'eighties. It was a veritable mountain, and in earlier days had evidently been an abrupt, towering cliff with the waters of Mechanics' Bay laving its feet. A ridiculous goat track led down from where, eventually, the Supreme Court buildings perched on its crown, and that track was ungravelled and barely drained. It was a dangerous track even for young folk and in daylight. Imagine, then, what terrors it presented to the wives of business men detained in town after dark —which, of course, nearly all were in winter. I remember hearing the wife of my uncle, John Reading, giving to my mother and aunt a graphic account of her own experiences in that respect. She told how of a rainy night, she would put the little daughter, Julia, to bed, wrap her head in an old shawl, and start out to meet her man. Remember, there were practically no street lamps in those days, and the main road was nothing but a few loads of blue metal thrown down in a quagmire. It was bad enough before Constitution Hill was reached, but then the poor creature's troubles really began. The slippery cliff path was a nightmare to her when her husband had to traverse it in the dark. In the seventies a scared goat could not safely have negotiated the hill at a gallop. Then we come to the road the tram is travelling upon. As I said, at this point in time the image was taken, it was Alpha Road, and had been since at least 1882 (the earliest reports seen in Papers Past, when the Parnell Borough Council were budgetting for a footpath to be formed there). Like Constitution Hill, it's a fair bit of a climb up from Mechanics' Bay. Before 1882, it was part of The Strand. From late 1938, it was Gittos Street, after Rev. 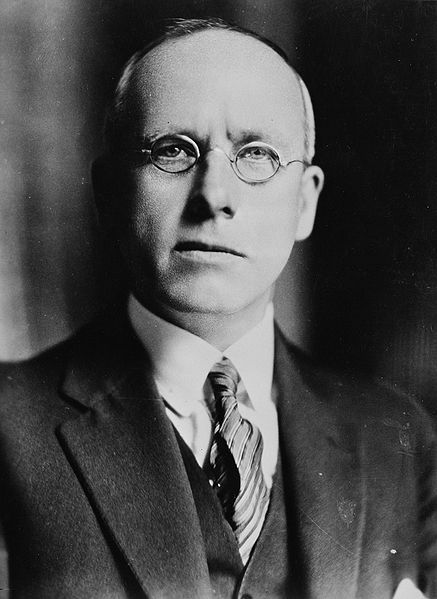 William Gittos. Then, in the mid 1980s, it was renamed again to Parnell Rise. What the tram is passing to the right of the picture is the site of Parnell School. 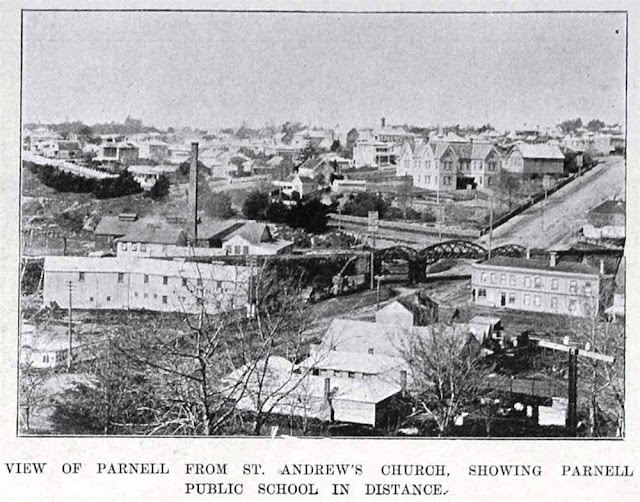 Just right of centre, above the railway overbridge in the image above, you can see the old Parnell School. 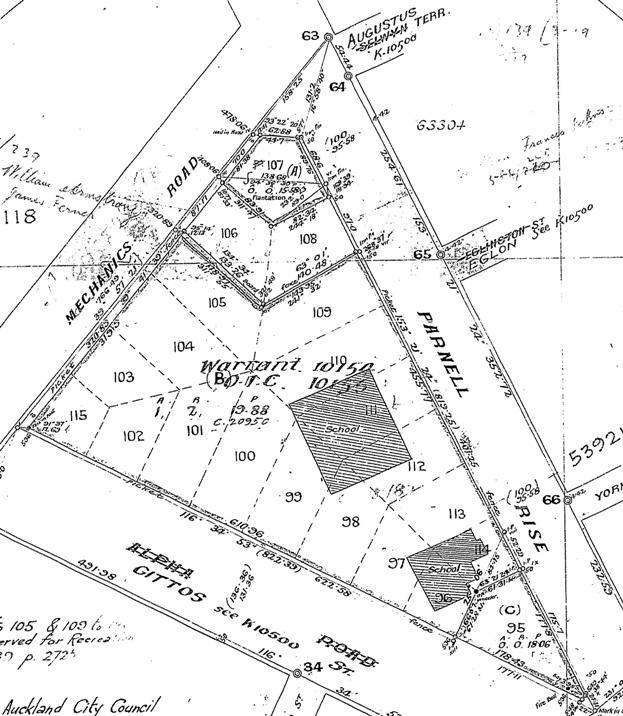 In 1875, the triangle of land between the three roads was granted by the Crown to the Auckland Provincial Superintendent for use as endowment property to provide income for the asylum at Pt Chevalier (NA 6/180). Then, in 1878, moves were made in Parliament to take a chunk of the asylum endowment property as a school reserve. Mr. Moss moved very briefly the second reading of the Parnell Reserve Bill. This bill was given notice originally as the Parnell School Reserve Bill, but the word "school" was dropped out subsequently, inasmuch as such a reserve would necessarily fall into the general education endowments, and seeing that the reserve was meant for the Parnell Borough Council, this result would have proved untoward. Mr. O'Rorke objected to the measure, on the grounds of Mr. Moss's extreme moderation; a much larger area of land ought to have been granted to the Borough. Mr. Dignan said that the land asked for was from portions of land long ago set apart as endowments for the Auckland Lunatic Asylum, and he strongly deprecated the attempt to deprive such an institution of its just right. Had Mr. Moss asked the Government for a small portion of the Auckland Domain grounds as endowments, and that ground was only about a hundred yards distant from the boundary of this Borough, he should have readily supported the claim, but he felt bound, on the score of justice, to object to this proposal to take from the Lunatic Asylum a portion of its too small reserve. If the House could consent to such a thing, what charity was safe—what institution of the kind in the colony was safe. He moved, “That the bill be read a second time this day six months.” After some consideration, the Speaker ruled that the schedule of the bill was informal, and so the matter is delayed. Mr. Moss will move in the business again, and probably may ask for a small slice of the Domain. 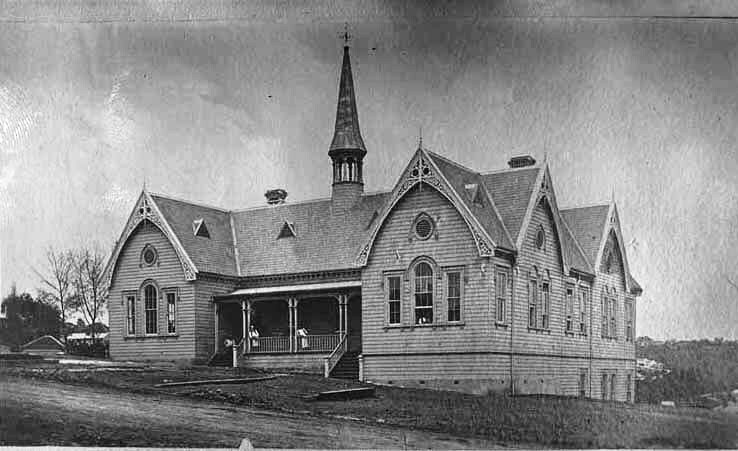 The school, probably c.1880 just after it was built on the reserve for £2000. Reference 1-W257, Sir George Grey Special Collections, Auckland Library. The Parnell Reserve Act 1878 was passed, though, and the land went to the education board. 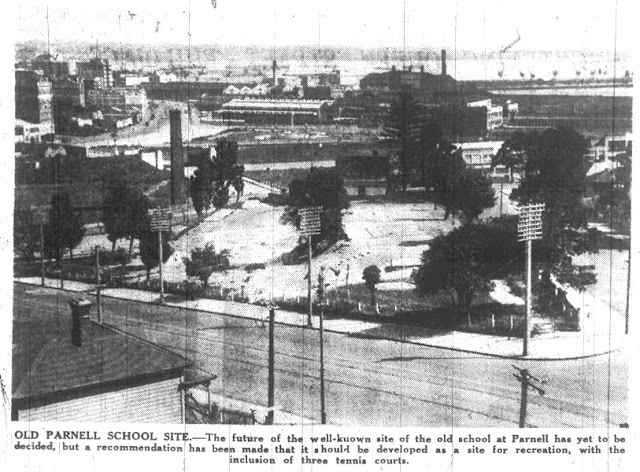 Opening of the Parnell District School. A small bit at the corner of Mechanics Road (now Augustus Terrace) and (what was then) Parnell Rise (now part of Parnell Road) was transferred to the Parnell Borough Council in 1914. (Pt. 107 in the plan above) This ended up as the site of the Borough Council offices -- made redundant when Parnell amalgamated with Auckland City a few years later. By 1932, it was realised that the site at the top of the hill was inadequate for a school in a busy suburb. The following year, the school shifted to St Stephen's Avenue. The land was zoned for business and industrial purposes in the town plan. On 8 June 1934, the department tried selling the subdivided site at auction -- but the auctioneer failed to get even a bid of £1000. (Star 8 June) These days, a piece of prime land like this in Parnell would have had bidders lining up with their wallets to purchase even a smidgen, I'd have thought. 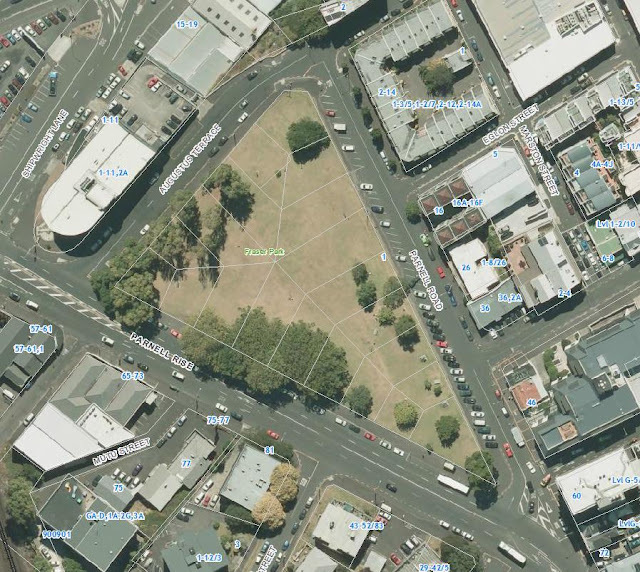 "There is no political significance in this," commented the Mayor, Sir Ernest Davis in suggesting to the Auckland City Council last night that it could do no better than name the old Parnell School site which is being transformed into a recreation ground, "Fraser Park". The Mayor made the suggestion because of the active interest taken in the proposal by the Minister of Education the Hon P Fraser. Still, considering Peter Fraser went on to become our Prime Minister during World War II, that does add a certain something to the name. The former asylum endowment land / school property was transferred back to the general government as Crown Land in 1939, and then gazetted as a recreation reserve in 1940, vested in the City of Auckland. (NA 186/67) Still with the education board's 1914 subdivisions existing on paper, the site remains as a Auckland Council public reserve. You mention that Parnell Rise was called Gittos Street until the mid-1980s. If that’s true it’s strange because I lived in Auckland until the late 70s and always knew it as Parnell Rise, not Gittos St. Is it possible that in addition to its official name the street had a colloquial name which later became the official name?